If you like to sew, need material for a prom dress, costumes for the Mermaid Parade or your latest art movie, or just want to have rainy day fun with your kids making pillows and curtains, where cab you find a fabric shop in Brooklyn? Brooklyn has plenty of great fabric stores with bolts and bolts of fabric at super affordable prices. However, they're not all nestled together in one "fabric district" anymore. So, you'll have to travel to different Brooklyn neighborhood shops. Bridge Street in the Fulton Mall used to be the place to go for fabrics in Brooklyn. But with the gentrification of Downtown Brooklyn--including the addition of health clubs, national chain stores, hotels and high-rise apartment buildings--yesteryear's Bridge Street fabric row stores have just about disappeared. But there still are dozens and dozens of fabric stores in Brooklyn, and that's not counting specialty shops selling materials for quilting, embroidery, knitting and heavier curtain upholstery fabrics. Why Bother With Brooklyn? Great Prices. Brooklyn fabric shops tend to have modest quality fabrics at quite low prices; you can get material for as low as $3 a yard in many places. The lower prices are a direct reflection of the rental prices in Brooklyn versus Manhattan.You will not find many bolts going at prices like $35 a yard. What follows is a partial list of popular fabric stores tucked away in various Brooklyn neighborhoods. Most of those listed are mom and pop shops. Some are run by immigrants. Some don't have websites, either; that doesn't mean they don't have good selections and bargains! Tip: If you're looking for something specific, call and ask. It will save precious time. Bay Ridge: J & A Fabrics, (718) 238-1440. Generations of sewers have come to this Bay Ridge store, long ago owned by two famously argumentative sisters. If you know what you are looking for, you can get amazing bargains on upholstery and fabric for clothing. What you see is what you get, don't even think about asking them to order more of this or that. Prices are very low. Carroll Gardens: Brooklyn General (128 Union St. (718) 237-7753. In Carroll Gardens, on the Columbia Street end of the 'hood, Brooklyn General sells a curated selection of tasteful contemporary fabric with an aesthetic geared to a young, hip market. Also known for its knitting yarns. Downtown Brooklyn: Fulton Fabrics, (398 Bridge Street, (718) 858 1596). The sole remaining store of its ilk on what was once Brooklyn's super-affordable "fabric row," this shop offers a wide range of fabrics including non-cotton lace, cottons, and mixed blend fabrics. Prices are low, and staff is helpful. Midwood/Flatbush: Lana Fabrics. (909 Kings Hwy. (718) 339-8940, near B, Q). You won't find high end fabrics here, but there's a selection of mostly or all cotton material appropriate for children's clothes, room decor and so on. Old school. Prospect Lefferts Gardens; Trim-Fabrics, (758 Flatbush Ave, (718) 284-9539). Crammed, but if you're a hunter, this is a good place to go and browse. Look behind the rolls of fabric to find...more rolls of fabric! Very affordable prices. Don't confuse it with the online site, http://www.trimfabric.com. Prospect Park South/Flatbush: Fabrics Save-A-Thon, 824 Flatbush Ave. between Linden Blvd and Caton Aves. (718) 282-9100: A very old fashioned, inexpensive Brooklyn fabric store; one of a chain. It helps to know what you are looking for because the staff may not be able to help much. Check the bridal area in the back. 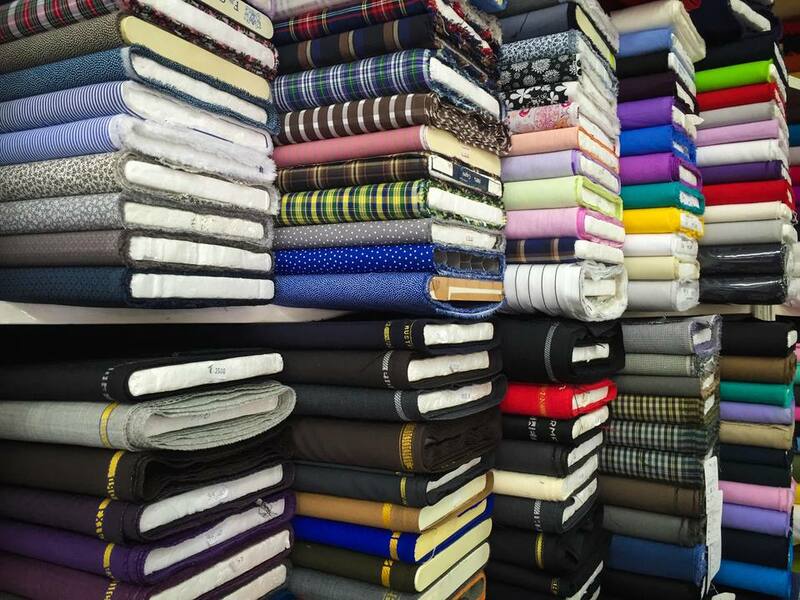 Quilting, Notions and Other Materials: If you're looking specifically for quilting materials, you might head to All Materialistic (1131 McDonald Ave, (718) 338-6104.) And there are many places for trim and notion items, including Borough Park's Katz's (4510 11th Ave. (718) 436-5198; call for hours); super friendly Fiber Notion in Park Slope (849 Union St. off 7th Avenue,(718) 230-4148) sells both quilting materials and a wide range of notions and trimmings online. In Sunset Park check out Juanita’s Bridal & Trimmings (5807 4th Ave., (718) 567-1200). In Manhattan/Queens: If Manhattan you must, check out the garment district and the lower east side, where there are fabric stores galore. Highly recommended: Joes, Zarin's and Mendel Goldberg Fabrics on the Lower East Side are justifiably famous (and close to the Manhattan Bridge, so you can bike from Brooklyn). Uptown, just walk down the street, but don't miss the third floor Mood Fabrics on West 37th Street, and Lace Star on W. 38th Street. And, if you are searching for ethnic-looking silk and faux silk that's highly decorated, try the extraordinary Indian/Pakistani sari and fabric shops in Jackson Heights, Queens, along 73rd and 74th Streets. Searching for more? Here's a tip. Skip YELP and use the Yellow Pages online to search for more Brooklyn fabric stores. (Tons of small businesses don't ever make it onto YELP but that doesn't mean they don't have what you're looking for, at affordable prices.) You might find a great little shop near your home or work: use the Yellow Pages map.